Rita’s Italian Ice is well known around the country for its sweet treats, especially during those hot summer months. Originally founded in Pennsylvania, Rita’s franchises can now be found in more than 30 states across the nation, including two locations in the city of Pittsburgh. These locations, on Fifth Avenue in Oakland and Forbes Avenue in Squirrel Hill, have both earned a Bronze designation with the Sustainable Pittsburgh Restaurant program for their commitment to building vibrant communities and a healthy environment in the Pittsburgh region. Depending on where you’re from, you may refer to the frozen dessert served by Rita’s as Italian ice, or water ice. Whatever you call it, it’s often compared to sorbet and sherbet, but it does not generally contain dairy or egg products. 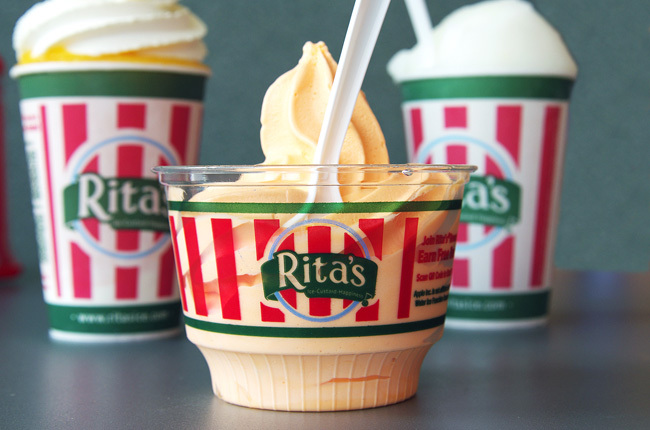 Rita’s serves Italian ice, cream ice, and sugar free Italian ice selections, rotating through more than 60 different flavors from day to day and season to season. Beyond the staples, Rita’s locations also serve up frozen custards, sundaes, frozen beverages, and offer a variety of toppings for your treats. Both the Oakland and Squirrel Hill locations of Rita’s are open seasonally, between March and October. The family friendly Italian ice stands are a great option for cooling off during a heatwave, celebrating a Little League game, or basically any other occasion you can think of. Rita’s also sells Italian ices by the tub, so you can bring their sweet flavors to your next birthday party or special event. Beyond just offering delightful desserts to its guests, Rita’s locations are dedicated to sustainability in the Pittsburgh region. Among the highlights of their sustainability practices, designated Rita’s locations onboard new staff members with sustainability training, donate and recycle old equipment and printer cartridges, and take steps to make their facilities energy efficient by turning lights off when not in use and using a programmable thermostat. To learn more about their sustainability efforts, you can view their profiles and read the complete sustainability assessments for Rita’s in Oakland and Rita’s in Squirrel Hill. Craving an Italian ice? Stop by Rita’s Italian Ice in Oakland at 3712 Fifth Avenue between March and October, 7 days a week from noon until 9pm. Or check out Rita’s Italian Ice in Squirrel Hill at 5880 Forbes Avenue between March and October, Thursday through Sunday from noon until 9pm.